The 10 Best Sushi Restaurants in Wisconsin! Creative combinations in sushi rolls are seemingly endless, and high quality restaurants crafting these delicious works of art continue to pop up across the state of Wisconsin. Quench your craving for global foods at these 10 great sushi restaurants in the Badger State. Screaming Tuna is Milwaukee’s top sushi experience. Try their Asian bistro dishes with your sushi. Their skyline views of the city are to die for if you are looking for an elegant night on the town. Prices are moderate, but not over the top. Located in Kenosha, Wisconsin—the very southeastern part of the state—is Soon’s Sushi Café. Their lengthy menu with both Japanese and Korean dishes on top of their sushi will have you swooning on Soon’s. Family owned with a casual dining experience and great prices make for a top spot on our sushi loving list. Zen Sushi Grill is another Milwaukee favorite. 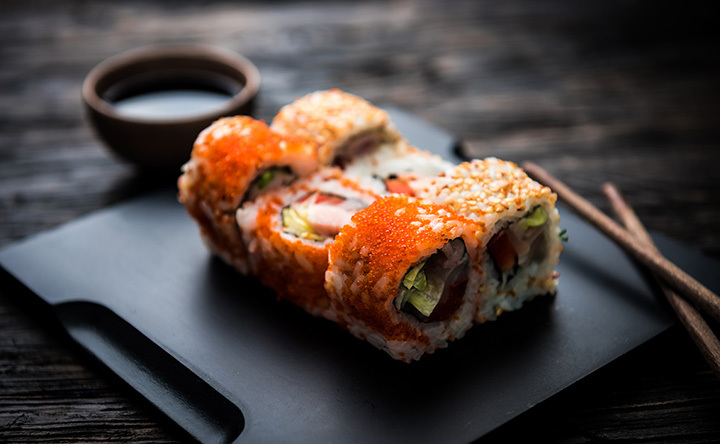 On Mondays, they offer a wallet quenching 25 percent off signature rolls, giving you the opportunity to try all types of rolls without breaking the bank. Choose from bar seating or an intimate booths/tables setting. With over 20 years of experience in the sushi business, Zen Sushi is a trusted sushi household name. As soon as RED Dine and Lounge hit the streets of Madison, the residents lined up. Their pricey but lengthy menu serves the Madison need for global foods in one spot. Having a creative, modern, and sleek atmosphere makes RED Dine Lounge the perfect Asian themed date night. Milwaukee is home to many secret sushi sanctuaries—Izumi’s included. Izumi is known as Milwaukee’s longest operating sushi serving restaurant to date. Thriving on serving, healthy, fresh, and authentic rolls along with other Japanese dishes—Isumi’s wants to be your affordable Milwaukee sushi destination. Up and coming town, Middleton is home to a lot of great business and restaurants, including Fuji Sushi and Hibachi. Dine in, delivery, or take out to enjoy in the comfort of your own home—do what you must but put Fuji Sushi on your go-to list. Plus, they have a special 10 percent off coupon on their website. Who doesn’t love discounts on food?! Serving the Brookfield, Wisconsin area, Wasabi Sushi Lounge has great deal on specials all year round. Check out any one of their party trays and the Packer Combos for a zesty twist on your normal sushi fares. Their made from scratch rolls try to incorporate seasonal favorites to spice things up in the sushi world. Osaka Japanese Steak House and Sushi is must-top for top notch rolls in the Fox Valley area. Their excellent menu and intimate setting makes date night much simpler. They have a full line of bar drinks and desserts for pre and post sushi gobbling. Kobe Sushi serves the Northwoods of Minocqua, Wisconsin. They have amazingly reasonable prices, great specialty rolls, fan favorites, and they are conveniently located on the Main Street in the famous downtown Minocqua.